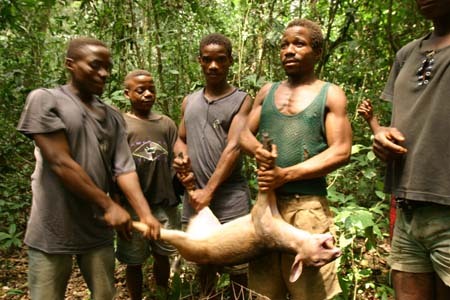 A Geographic look at bushmeat hunting in DRCongo. 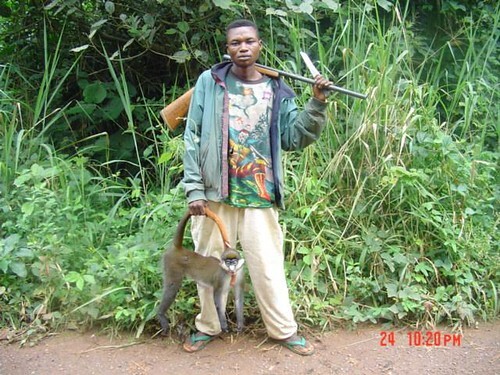 Are there safe sites for forest animals in DR Congo ? It is, after all, a country of many protected areas. Are these parks and reserves safe? Information from the recent war and post war period is not reassuring. 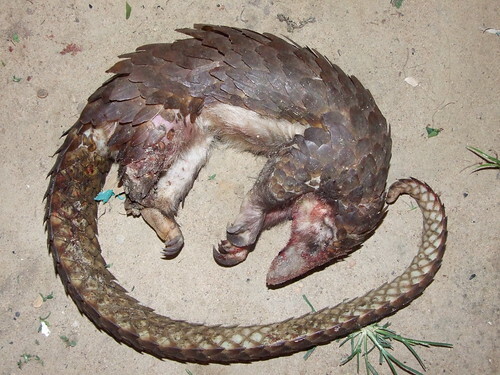 Protected areas were/are very permeable to arms and bushmeat trafficking. The very fact that there are people to quote, means that there are people fighting to assert the integrity of these areas. Major setbacks have been followed by major steps forward. Park guards in the Okapi Reserve arrested, and are transporting this poacher to the Park Center in the Ituri Forest. We CAN have a future WITH Congo’s forest animals. 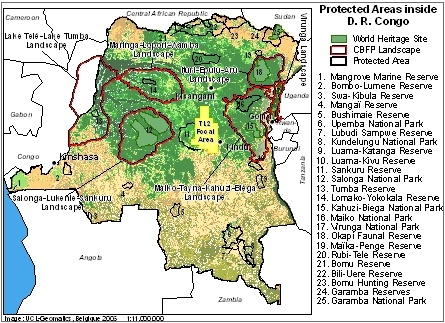 The promise lies in formal protected areas. Although far from problem-free, these can make a big difference that we are now beginning to witness. How so? 1) There is a legal basis to arrest and prosecute not only elephant poachers but bushmeat hunters in protected areas. 2) There is a national institutional structure with wardens and park guards, the Institut Congolais pour la Conservation de la Nature (ICCN). 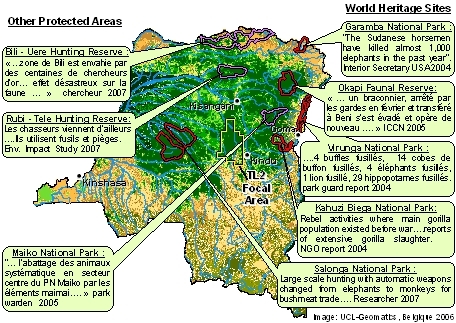 3) There is an international interest in Congolese protected areas and nature conservation. This international interest brought key protected areas through war with borders intact and animals inside. And it is that international interest that is allowing ICCN and the protected areas to reconstitute post-war. 4) Finally: new areas. There are remote areas that retain rich faunas. The ICCN is committed to protect these. 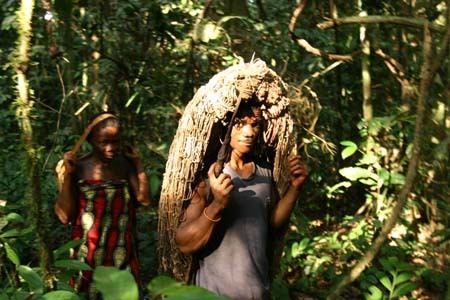 Effective protection will depend upon discovery of the most crucial areas and effective support from local populations. Then national and international backing must be brought to these areas so that ICCN can build a park infrastructure from ground up. During the war in Maiko Park, Maimai and Simba rebels lived off the park. Inside protected areas today, animals have a far better chance of NOT dying at the hand of man, than they do outside. This is despite the slackening of protection during the war. 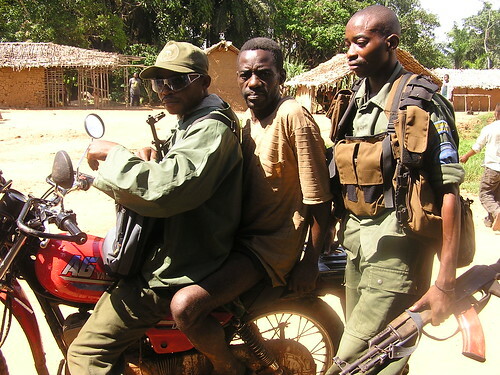 In the Okapi Reserve, uncontrolled military, using automatic weapons, were the elephant poachers. 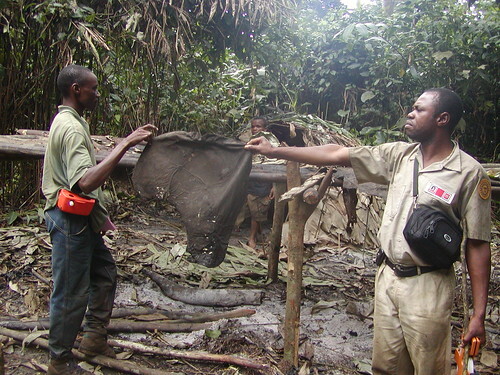 Here Crispin (now in TL2) holds up an elephant ear left by poachers in their camp. Our exploration teams marched through some forests in the west and north of the TL2 landscape that had been emptied by bushmeat hunters, showing how important it is to manage – and protect – forests like those of the east and south of TL2, that have abundant and rare animals. In the Rubi Tele Reserve there are over thirty small scale diamond mines (100 or fewer miners) with one very large one (several thousand miners) outside. All the miners live off of bushmeat from Rubi Tele. • to support traditional lifestyles …..
A completely protected area, a national park, would mark off for our nearest animal relatives (bonobo) their own corner of the world. TL2 should be one of those corners – or rather a commons for apes right in the middle of Congo. TL2 is right in the middle. Let it be a bonobo commons. And within it, let there be a national park. And soon , more about protecting the TL2: Challenges and Solutions. Okapi Faunal Reserve: “…I have the honor of informing you…a poacher, known as Master, was arrested by park guard of the Okapi Reserve in February 2004 and was transferred to Beni from where he slipped away a couple months later and is now again poaching in the Okapi Reserve.” Inventory team leader, Okapi Reservem July 2005. Rubi Tele : “…the big hunters come from elsewhere. They use 12 caliber rifles as well as snares…” environmental Impact Study 2007. This entry was written by Terese Hart, posted on 2008-03-09 at 8:09 pm, filed under Bushmeat, Diamonds, gold and guns. Bookmark the permalink. Follow any comments here with the RSS feed for this post. Post a comment or leave a trackback: Trackback URL. protect such a huge area? in a traditional way. in this region survived a rich wildlife including a lot of bonobos. the same in the ituri forest. Is it possible that the pure existence of this people discourage commercial hunters? Unfortunately that is not the case. 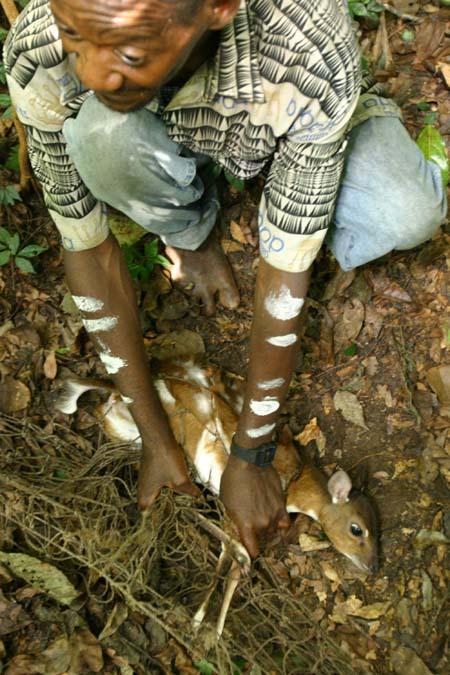 Certainly the Mbuti in and around the Ituri are used by bushmeat traders who follow them into the forest and take the game for little return. Just a further clarification. In the Okapi Reserve, a part of the Reserve is completely protected — no hunting — and the challenge for the Mbuti as well as the park rangers is to control exploitation of the Mbuti by bushmeat traders in the rest of the reserve where traditional hunting is allowed. Terese, how much more time do you roughly estimate it will take to go from this present phase of choosing the best area, before you go into the next phase, which I assume will be submitting your research to the authorities? I learned from the BCI that the use of local NGO’s from neighboring communities has been beneficial to both the local people and the bonobos located in the Sankuru Nature Reserve. I’m looking forward to your next post dealing with both the challenges and solutions. I would loved to participate with any program that helps these bonobos find peace. I read last night about a group of bonobos who learned sign language, this article brought me to tears. These primates have such intelligence, but more importantly, their capacity for empathy for others, motivates me to do whatever I can to help save them. I appreciate all you guys are doing to make this national park a reality. I think that to be successful both have to happen at once or at least : exploration and preparation for a protected area have to happen at once although final submission to national authorities is a ways away (one year???) Preparation for a protected area includes local community conservation projects, conservation education, and a lot of talking with more local and regional authorities. These are all going on now and Ashley, Crispin and Dino have sent me some great pictures. So next post! Hey y’all, I just made a small donation in honor of my friend Liz’s birthday today. Thank you for all your hard work for wildlife conservation. Thanks, Terese, it makes sense. We are looking forward to hearing more. Sheryl, Thank you sooo much. The loyal and supportive following that all of you are is a major encouragement to the work in the field. Thank you!! BUNIA, 12 March 2008 (IRIN) – The international community has released US$5.7 million as a first tranche of aid this year to stabilise the troubled district of Ituri in the northeast of the Democratic Republic of Congo (DRC), Ross Mountain, UN resident coordinator and special representative of the UN Secretary-General in the country, said. Having just watched the film “Lumumba”, I am just a little worried about the international community’s financial investment in that region – and how timely your work is – and wondering how much the local tribes feel it is their land to protect, especially if land ownership has not been their way of life…. when i was young i grew up in very beautiful landscape in a very beautiful landscape. It was destroyed by a dam. So let the humans starve? Seems that some folks think the Africans that are hungry need no focus. If folks were not hungry they would not hunt,and if foreigners weren’t buying much of the items there would be less pouching. Yes great to help animals, but how about also thinking of the Black Africans, right?